All rods are built using super Zee ferrules and come with a fitted cloth bag and aluminum outer tube. Please indicate your preference on the rod to build. 1. Fishing Length--6' .. 6'6" .. 7' .. 7'6" .. 8' .. 8'6" .. 9' .. 9'6". 2. Line Weight--2, 3, 4, 5, 6, 7. 3. 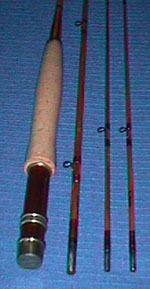 Function--Fly Rod,..Spin Cast,..Bait Cast. 5. Reel Seat Material--Black Aluminum,.. Aluminum,.. Nickel Silver. 6. Reel Seat Insert--Cork,..Dark Wood,..Light Wood,.. other..?. 7. Cork Grip Shape--Full Wells,.. Half Wells,.. Standard,.. Western. 8. Guides--Black,.. Gold,.. Single-foot,.. Standard,.. Oversize. 10. Two Section with One Tip,....Three Section,....Additional Tip. 13. Distance of Average Cast--15',.. 20',.. 25',..30',.. 35',.. 40',.. 45'..